Beautiful collage, and the iPad is what I'm currently contemplate on having. Gorgeous photos. That food looks yummy! Yay for the ipad arrival! :) Those flowers are so pretty. Thanks for linking up. Have a great weekend. iPads are so fun! Makes me feel like I'm on the Jetsons. Your pictures perfectly capture the season. They just look like late spring. Beautiful! Such a pretty collage this week! Loving all the springy photos :) I think the fountain is my fav! 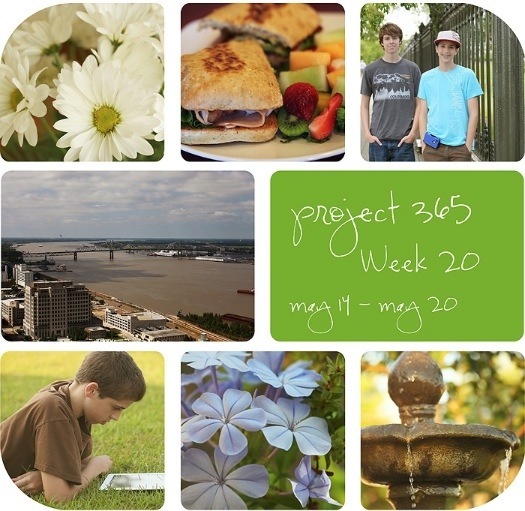 What a great week of photos! Love the flowers and the shots of your boys- you are going to have to pry the ipad out of your boys hands too. Mine love it! Are you guys getting flooding down there? Gorgeous collage!!!!! The shot of downtown baton rouge is amazing!!! As always, I love them all. That lunch looks really good and the daisies are awfully pretty! Your fountain shot is beautiful- but I really do like the shots of your handsome boys! Looks like you have a wonderful relationship with them. You capture that well! The flower shots and fountain shot are great. Your boys are such handsome young men. I bet they will be so happy to have your fantastic shots of them when they are older. Love your flowers. Congrats on the new ipad.